"Our study is the first to investigate thrombospondin-1 during acetaminophen toxicity," said McMillin. 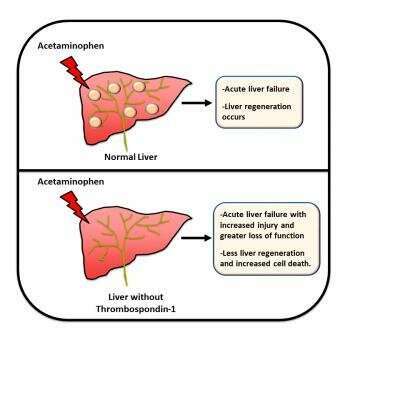 "We were able to identify cell communication pathways that do not work properly during acetaminophen-induced liver injury and thus lead to worse outcomes." More information: Matthew McMillin will present this research on Saturday, April 6 at 7 p.m. during the Experimental Biology Welcome Reception in Valencia Ballroom ABCD, Orange County Convention Center and on Monday, April 8, from 11:45 a.m.-12:45 p.m. in room Exhibit Hall-West Hall B (poster A62 662.62 ) (abstract).